When not writing, she juggles her packed schedule, as well as that of her four children, while desperately trying to squeeze in a date night with her husband. Lois daydreams of peace and quiet by the beach armed only with a glass of Riesling and a great book. Her debut mystery novel LIQUID LIES, was an Kindle top 100 bestseller as well as won an Eric Hoffer Award. She is now working on her new cozy mystery series, the CHUBBY CHICKS CLUB.. Book one, DYING FOR DINNER ROLLS, became a Kindle Bestseller and spent over six weeks as the #1 cozy mystery. Book two in the series, MURDEROUS MUFFINS will be released by the end of 2013. 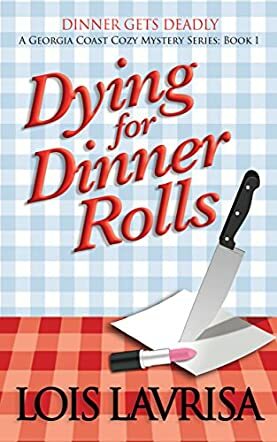 Dying for Dinner Rolls by Lois Lavrisa is a fast paced, fun filled cozy mystery that provides plenty of laughs as the reader tries to figure out who actually committed murder. Catherine Thomson is a 40-year-old mother of two sets of twins, one set is five and the other is eighteen. She meets a couple of times a month with a group of her friends that call themselves the Chubby Chicks club. When one of their members, Lucy, winds up dead, the police want to label it a suicide but Cat can't help but be reminded of her father's death a few months ago. His murder happened late one night in a robbery gone bad at his organic health food store located in Savannah, Georgia. It's been more than two months and there are still no suspects, so Cat decides it's up to her and the members of the Chubby Chicks to solve the murders. Only one member, Annie Mae Marple, is willing to help. Can these two wanna-be private eyes figure out whether their friend was murdered or not, and if so, who actually committed the crime, or will they become the next victims? Will Cat find the answers to her father's death, and is it related to the murder of their friend Lucy? Dying for Dinner Rolls takes readers on a romp through Savannah as Cat and Annie Mae try to figure out both deaths and any connections. The author is a true wordsmith who paints an amazing picture with the words she selects. The antics of Cat and Annie Mae were totally funny and had me hooked. I couldn't turn the pages fast enough to see what these two might get up to next. The mystery was very well done. Ms Lavrisa provides more than a few suspects and doesn't make it easy to figure out who actually might have killed Lucy. A fast paced plot that never lagged; unique, interesting characters; a splash of southern charm, along with a well written mystery made for a page turning read. I think Lois Lavrisa has certainly got a winning series with the Chubby Chicks Club Mysteries and I can't wait to read the next book in this series.